Carrots can be grown in a variety of sizes and forms - traditional long, tapered ones, short ones, tiny finger-like ones, even little round ones. There are yellow, orange, and even purple varieties. These root vegetables are the domestic descendants of Queen Anne's Lace, the edible wild carrot. Breeding has developed better flavor and sweetness by reducing the size of the pale core, which is lower in sugar and vitamins, and increasing the sweet fleshy part of the root. Most varieties of carrots require about seventy growing days. Carrots are cool-weather plants. Growing them in really warm weather results in a woody texture and poor flavor and color. Growing through the hot summer sometimes results in carrots that have "bolted" - that is, flowered and set seed. Some varieties are bred to be bolt-resistant. 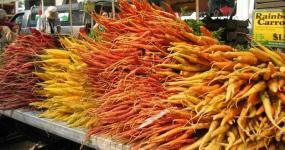 In warm climates, carrots are grown in the fall, winter and spring. In cold climates they are grown in the spring, summer, and fall, and can be left in the ground all winter and harvested the following spring during 'mud season' - a real prize for the gardener! Carrots prefer a sunny site, but they can be grown in partial shade. These vegetables need consistent moisture and good drainage. If you're growing them in raised beds or in a dry area, be sure to water regularly. The very long varieties can get by with a little less water, since the root reaches deep into the soil below the dry surface. Soil that has been amended with organic matter will retain moisture better. Mulching helps keep soil moist. Carrots like a deep, loose, fertile loam. If your topsoil is shallow, or if the soil is quite heavy even after amending, you can still grow the shorter varieties. The soil should have a very fine texture. If carrots encounter obstacles like stones, clay lumps, debris, and so on, they will twist, bend, fork, or even stop growing entirely.Carrots are a root crop, so the ideal soil is rather low in nitrogen and high in phosphorus and potassium. The ideal pH is around 6.5. In cool climates, you can plant carrot seeds in early spring, as much as four weeks before the last expected frost. Continue to sow seed every two weeks or so until the first of August, so that you will have mature carrots in late fall and early winter. Seed is sown directly in the garden. Planting in single rows makes it easier to mulch and preserve moisture. Wet the seed bed or furrow thoroughly before planting to speed up germination. Space seeds about one inch apart. Carrot seeds are tiny. Some gardeners mix them with sand or coffee grounds to make it easier to distribute them evenly. It is possible to purchase pelleted seeds of some varieties. Cover the seeds with about one-half inch of very light soil, sifted compost, or vermiculite. Water with a fine spray. Cover with a light layer of straw or salt hay to shade the seeds and preserve moisture. Some gardeners cover the planting site with wet burlap, especially if they are going to be away for a few days and won't be able to water the seeds. Some gardeners plant carrot seed together with quick-germinating radish seed; the radish seedlings will sprout first and shade the slower carrot seedlings. Carrot seedlings take a long time to germinate. Keep the bed moist, and be patient. Carrots should be thinned several times during their growth period. The first thinning should take place when the seedlings are one to two inches high. Eliminate any seedlings that are closer than half an inch to another seedling. The easiest method is to use scissors to snip them off without damaging the seedlings left to grow. Thin a second time when the row is looking crowded, and a third time if necessary. These tiny carrots can be pulled up and eaten. (They're especially good tossed in salads.) After the final thinning, each plant should have enough room to grow to maturity. 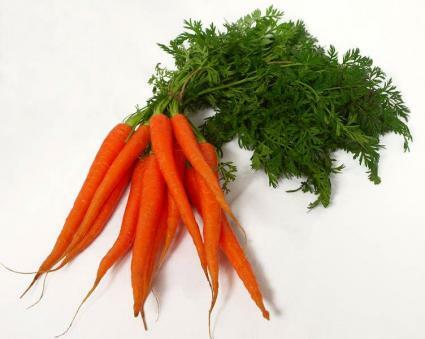 Keep carrots moist while they are growing, and water regularly during dry weather. Many gardeners apply liquid fertilizer once, when the carrot tops are about six inches tall. The last crop can be heavily mulched and left in the ground over the winter for a spring harvest. Carrots are easy to harvest. Give them a twist when you pull them up, so that the top does not break off in your hand, leaving the root in the ground. Cut the leaves off right away. They look pretty, but they will continue to grow, pulling moisture and nourishment out of the edible root.Carrots keep a long time in the refrigerator. They can also be stored outdoors in boxes placed in mulched pits or trenches, or in the cellar in garbage cans filled with moist sand.